With the RBI setting new rules on the free use limit of transactions at bank and charging a fee for every transaction beyond the free limit, all major banks have introduced “Missed call banking facility” for Inquiries regarding Account balances and latest transaction details can be made through your mobile phone for free. As we are using only missed call facility, we do not need to pay anything. Thanks to the mobile banking facilities. You can get to know my bank details on the phone and you don’t need to use Net banking or an automated teller machine (ATM) for simple balance enquiries. Missed call banking facility provides banking services that include balance enquiry, mini statement, cheque book request, account statement request, email statement request. The services vary across banks. All major Banks including SBI, HDFC Bank, Axis Bank, ICICI Bank, Punjab National Bank etc., facilitates Missed call Services. How to know the bank account balance on your mobile? To know your account balance on your mobile , all you have to do is follow the steps given below. • Call your respective banks's toll- free number . • The call will be either disconnected automatically or after a voice message . • An SMS with the account balance will appear on your Message inbox in few seconds . Some banks also have a dedicated Toll-free numbers to get mini-statement or latest bank transactions details. The procedure to get the latest transaction is also simple. If your number is already registered with your bank, you can directly call the below listed number(s) and start using the missed call alert facility. To register your Mobile Number, some banks might require you to send in a SMS to their toll-free number in the standard format provided . •The registration Process varies from bank to bank and a few banks deoes not require a seperate regstrartion as the moblile number is already updated with the opening of the account . If your mobile number is not registered, you will mostly get an SMS as “Your mobile number is not registered for this service”. If you have multiple savings accounts with the same bank, the default account will mostly be the latest opened account. Some banks limit the no of times that you can avail this facility in a day. SMS Banking service allows you to access your account information through mobile phone. SMS banking services can be customer initated or bank initiated . The bank initiated (PUSH) services are periodic account balance reporting (For eg. End of the week ), reporting of salary and other credits to the bank account,successful or un-successful execution of a transaction, insufficient funds, large value withdrawals on the ATM orn a debit card or for OTP(one-time password authentication). The customer Initiated (PULL) Services are Account balance enquiry, Mini statement request, Electronic bill payment etc. The Allahabad Bank balance enquiry number is 09224150150. Just give a missed call to the Allahabad Balance enquiry number from the registered mobile number and the account balance information will reach you by an SMS. The Bank of Baroda balance enquiry number is 09223011300. Just give a missed call to the Andra Bank Balance enquiry number from the registered mobile number and the account balance information will reach you by an SMS. The Bank of Baroda balance enquiry number is 09223011311. Just give a missed call to the BOB Balance enquiry number from the registered mobile number and the account balance information will reach you by an SMS. The Bank Of India balance enquiry numbers are 09015135135/09266135135. Just give a missed call to the BOI Balance enquiry number from the registered mobile number. The account balance information will reach you by an SMS. This bank provides balance inquiry facility by missed call on the number 09212438888. The account balance Balance information will reach you by an SMS. Canara Bank balance enquiry number is 09289292892. Just give a missed call from the registered mobile number. The account balance information will reach you by an SMS. Central Bank of India balance enquiry number is 09222250000. Just give a missed call to the Central Bank of India balance enquiry number from the registered mobile number and the account balance information will reach you by an SMS. Corporation Bank balance enquiry numbers are listed below separately for domestic and NRI customers. Just give a missed call to the Corporation Bank balance enquiry number from the registered mobile number. The account balance information will reach you by an SMS. For Domestic Customers ( HINDI) – 09289792897. For Customers living abroad (HINDI) – 919289792897. For Domestic customers (ENGLISH) – 09268892688. For Customers living abroad (ENGLISH) – 919268892688. Dena Bank Account balance enquiry number is 09289356677. You can get mini statement at 09278656677. Just give a missed call to the Dena Bank balance enquiry number from the registered mobile number and the account balance information will reach you by an SMS. For IDBI Bank balance enquiry, give a missed call to 09212993399 or SMS “BAL” to 9212993399. The account balance information will reach you by an SMS. Indian Bank Account balance enquiry number through SMS is 9444394443. You can get the account balance by sending a simple SMS to that number. For SMS balance enquiry in Indian Bank, type BALAVL <Account number> <MPIN> and send to 9444394443. The account balance information will reach you by an SMS. Indian Overseas Bank Account balance enquiry number is 04442220004. Give a missed call to the IOB Balance Enquiry number from your registered mobile number. For SMS balance enquiry in Indian Overseas Bank, type BAL and send to "+919551099007". You can get the account balance by sending a simple SMS to that number. The account balance information will reach you by an SMS. Oriental Bank of Commerce Account balance enquiry number through SMS is 9915622622. You can get the account balance and mini statement by sending a simple SMS to that number. For SMS balance enquiry in Oriental Bank of Commerce, type “ACBAL <space> 14 digits Account number" and send it to 9915622622. The account balance information will reach you by an SMS. For Mini statement enquiry in Oriental Bank of Commerce, type “STMA <space> 14 digits Account number" and send it to 9915622622. The account balance information will reach you by an SMS. The Punjab & Sind balance enquiry numbers are 1800221908 (Toll Free) and 02227811200 (paid). Just give a missed call to the Punjab & Sind balance enquiry number from the registered mobile number and the account balance information will reach you by an SMS. The Punjab National Bank balance enquiry numbers are 18001802222 and 01202490000. Just give a missed call to the Punjab National Bank balance enquiry number from the registered mobile number and the account balance information will reach you by an SMS. The State Bank Of India balance enquiry number is 9223488888. Just give a missed call to the SBI Balance enquiry number from the registered mobile number and the account balance information will reach you by an SMS. You can also get SBI account balance by sending a SMS with a message "BAL" from your registered mobile number. Syndicate Bank balance enquiry number - 09241442255 and 08067006979. Just give a missed call to the Syndicate Balance enquiry number from the registered mobile number and the account balance information will reach you by an SMS. The Bank of Baroda balance enquiry number is 09278792787. Just give a missed call to the UCO Bank Balance enquiry number from the registered mobile number and the account balance information will reach you by an SMS. Union Bank Of India balance enquiry number is 09223009292. Just give a missed call to the Union Bank Of India Balance enquiry number from the registered mobile number and the account balance information will reach you by an SMS. For primary account balance, give a missed call to 09223008586. For primary account balance by SMS, type “UBAL” and send it to 09223008486. For Mini statement, type “UMNS” and sent to 09223008486. The Balance information will reach you by an SMS. The Vijaya Bank balance enquiry number is 18002665555. Just give a missed call to the Vijaya Bank Balance enquiry number from the registered mobile number and the account balance information will reach you by an SMS. The Axis Bank balance enquiry number is 09225892258. Just give a missed call to the Axis Bank Balance enquiry number from the registered mobile number and the account balance information will reach you by an SMS. The Axis Bank balance enquiry number is +918067747700 . Just give a missed call to the Dhanalaxmi Bank Balance enquiry number from the registered mobile number and the account balance information will reach you by an SMS. The Federal Bank balance enquiry number is 8431900900. Just give a missed call to the Federal Bank Balance enquiry number from the registered mobile number and the account balance information will reach you by an SMS. The HDFC Bank balance enquiry number is 18002703333. Just give a missed call to the HDFC Bank Balance enquiry number from the registered mobile number and the account balance information will reach you by an SMS. For Mini statement, give a missed call to 18002703355. For balance details through SMS, type “BAL” and send it to 5676712. For mini statement, type “TXN” and send it to5676712. The account bank Balance information will reach you by an SMS. The ICICI Bank balance enquiry number is 02230256767. Just give a missed call to the ICICI Bank Balance enquiry number from the registered mobile number and the account balance information will reach you by an SMS. For bank account balance details through SMS,Type “IBAL <space> Last 6 digits of your account number” and send it to 9215676766. The Balance information will reach you by an SMS. The Karnataka Bank balance enquiry number is 18004251445. Just give a missed call to the Karnataka Bank Balance enquiry number from the registered mobile number and the account balance information will reach you by an SMS. The Karnataka Bank mini statement enquiry number is 18004251446 . Just give a missed call to the Karnataka Bank mini statement enquiry number from the registered mobile number and the mini statament information will reach you by an SMS. The Karur Vysya Bank balance enquiry number is 09266292666. Just give a missed call to the KVB Bank Balance enquiry number from the registered mobile number and the account balance information will reach you by an SMS. The Karur Vysya Bank account statement enquiry number is 09266292665. Just give a missed call to the KVB Bank account statement enquiry number from the registered mobile number and the account statament information will reach you by an SMS. The Kotat Mahindra Bank balance enquiry number is 18002740110. Just give a missed call to the Kotak Mahindra Bank Balance enquiry number from the registered mobile number and the account balance information will reach you by an SMS. For Lakshmi Vilas Bank balance enquiry, type “LVB BAL <CustomerNo>” and send it to the LVB balance enquiry number 9282441155. The account balance information will reach you by an SMS. The South Indian Bank balance enquiry number is 09223008488. Just give a missed call to the South Indian Bank Balance enquiry number from the registered mobile number and the account balance information will reach you by an SMS. The YES Bank balance enquiry number is 09840909000. Just give a missed call to the YES Bank Balance enquiry number from the registered mobile number and the account balance information will reach you by an SMS. The CITI Bank balance enquiry number is 9880752484. Just give a missed call to the CITI Bank Balance enquiry number from the registered mobile number and the account balance information will reach you by an SMS. For bank account balance details through SMS,Type “ BAL <space> last 4 digits of your debit card number” and send it to 52484 Or 9880752484. The Balance information will reach you by an SMS. 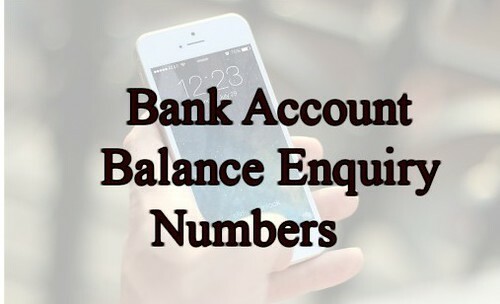 Hope you find the above article useful to find your bank's balance enquiry numbers. The numbers might vary from time to time. If you feel the number is outdated and need to get updated, please leave a comment in the comment section. We are happy to update it.